During the 19th century many unscrupulous drug and medicine manufacturers made many deceptive claims about the healing properties of their products and often these remedies contained only non medicinal ingredients like vegetable extracts and sugar. Some medicines were more harmful and contained stimulants such as caffeine and alcohol and some even contained opium and cocaine. 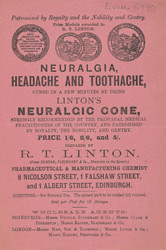 It was not easy to identify which medicines were genuine and which were ‘quack cures’. What do you think about the medicine featured in this advert?